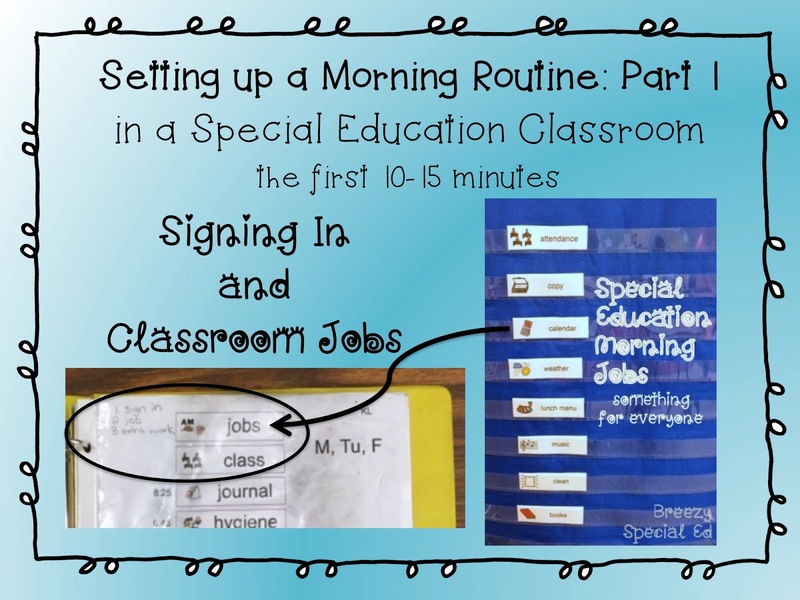 Especially important in the special education classroom, is a consistent morning routine. When students know what to expect and there are no surprises, things run a whole lot smoother. As an extra bonus, it makes things easier for the teacher as well!! My students come in anytime between 15 minutes before the bell rings to 5-10 minutes after the bell rings. Before the bell rings, I'm very relaxed with what they choose to do. Some students prefer to just sit at their desk, others follow a sensory diet, and others want to get started with their daily tasks, but oddly enough, no one has ever picked a "free time" choice, even though it has been offered! Once the bell rings...I'm going to shock you all and you're going to think I'm a terrible American...I don't care if my students stand up and say the pledge or not. I certainly model it, and I encourage students to do it, but if they don't, no big deal! This mindset definitely comes from a couple of years ago when I had a student who would "go off" at requests like this that interrupted his morning routine and it wasn't worth it! Plus, this is a few of my students' sensory time, and I'm not interrupting that! And, when else do you ever stand for the pledge?! The national anthem at games, sure, and we practice that, but sorry, forcing a student to stand for the pledge is not worth having our morning start on a bad note. Okay, bunny trail/tangent over, back on track! Once the pledge/announcements are over, I expect student to sign in and complete their morning job. As students walked into class, they grabbed their binder. In this binder, they have their individual schedule and their sign in sheet. 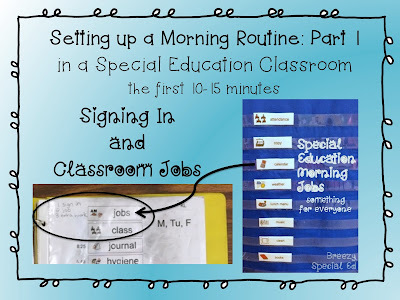 For the sign in sheet, some students use a name stamp, others work on writing their first name, other work on their full name, the date, and the time. 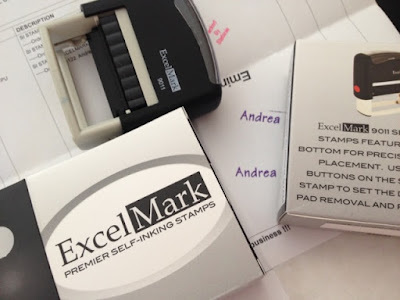 Psst...I bought name stamps from Discount Rubber Stamps last year for my students who could not write and was super happy with them! You can customize the font and color, and it lasted all year and is still going strong! Oh, and they were only $3 each (now $4, but still a great deal)! A trick to help your students stamp their name right side up instead of upside down, put a sticker on the side that needs to face them - boom - worked like magic! After signing in, students complete their jobs. Our jobs rotate monthly and almost all students will have a turn to do each job. I assign jobs by putting their name or picture next to the job title as seen below. I modify the jobs for each student as needed. The bottom jobs are my "extra" jobs that don't really need to be done, but students need something to do! 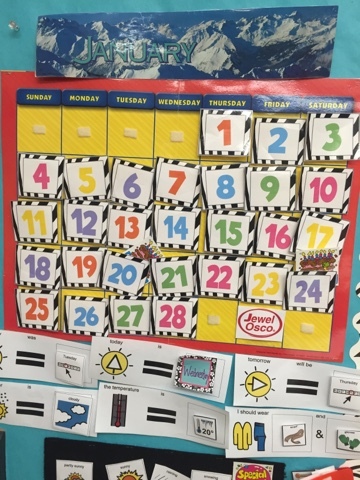 Calendar: Goes to our class calendar and adds today's date, fills out yesterday, today, and tomorrow by days of the week, sets our classroom block calendar, and then being prepared to tell the class what day it is (ex. "Today is Monday, August 10, 2015"). Weather: Looks up weather on the iPad, fills out "the weather is" strip, moves the arrow to the correct spot on the temperature chart, and fills out what we should wear today based on the weather. Get our temperature chart here. Attendance: Moves student and staff pictures to either home or school depending on who is at school for the day. Copier: Makes copies of (or just grabs from the folder if our little copier is broken like it was for the second half of the year) each student's daily sheet and passes them out. Lunch: Look at the weekly lunch menu and easily finds pictures on his/her device or types in the iPad to get a visual of the hot lunch option for the day. Music: Chooses a youtube video (classical music option) to softly play during morning work time. Books: Make sure books are in their correct bins. Not one of our current jobs, but pencil sharpening is a good one to add if needed too! Any other jobs that you do with your students? I'd love to hear about them! Update: see part 2 here. I have students wipe down tables and desks. And hand out corrected papers into thier mailboxes. Great list! I struggle with getting my kids all on the same page first thing in the morning. I love the idea of morning "jobs". THANKS!!! About how long do you have for your morning job time? Also, what do your kiddos do right after (you mention copier of morning worksheet). Thanks!!! Thanks! I typically have 10-15 minutes from when the bell rings to when we start class. If they finish early, they have morning work in their binders, which I will talk about more in part 2! 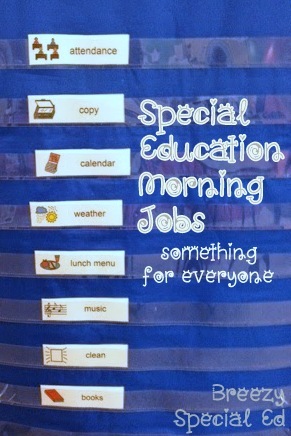 :) The copies are just of their daily sheets, which the aides fill out so parents know what they did at school! during morning meeting each student has a job similar to yours. Our pm jobs include cleaning tables, vacuuming (i loooove our lightweight cordless vacuum - we put holes from hole punch on floor to know when they are done, as they are all gone), shredding (child safe shredder w 1:1 supervision), picking up garbage. Last year we also had plugging in iPads, and when I had older students they also washed dishes. What sensory activities do you have for your students do choose from before the bell? We only do afternoon jobs: wiping tables, wI ping chairs and door knobs, plugging in iPad and communication devices, taking out trash, taking out recycling (both of these for more than one classroom ), doing laundry for school nurse (sheets, pillow cases and towels), folding these items and returning them, doing laundry for the PE dept (sport uniforms), shredding for the sped dept, sharpening pencils, sweeping the floor, helping the custodians in the cafeteria one day a week. I divide these into classroom jobs and school jobs. However, I am going to do morning jobs ( which will encompass some of what you are doing and our other classroom jobs), and then school jobs in the afternoon. I loved your ideas. I am wanting to use the name stamps with a few of my kiddos but not sure what size font to order. Any feedback would be greatly appreciated. Get the biggest font that fits!!! I have live plants in the science center that students water and they also take care of the plants they grow in the front of the school. Plant helper is great for students that need a sensory walk in the morning. Half of my class eats breakfast in the room after the pledge then they are taken to the bathroom. The other half goes to the lunchroom to wipe down all the breakfast tables. They each have an assigned section to clean each day. They sign in and sign out daily(Data for progress through the year) and for every four days they work they get a free treat ticket to use in the lunchroom. The lunch ladies wanted to give them a daily treat but I have a student with diabetes and needed to control his access to treats. How about feeding the class pet? Charging devices/coiling and storing wires/peripherals? Cleaning the blackboard (if anyone still uses those!)? Taking attendance to the office? Getting needed supplies (paper towels, tissues, cups, etc) from the custodian and putting those away? Setting up individual daily schedules? Class reporter: takes notes or records school news from the daily announcements and outside news from kids newspaper to report to the class?